Why Choose SunShop Shopping Cart? When it comes to building an online store, it’s important to have a flexible eCommerce system that can support the needs of your business. SunShop Shopping Cart Software gives you that flexibility and support through a robust, feature-rich eCommerce platform. 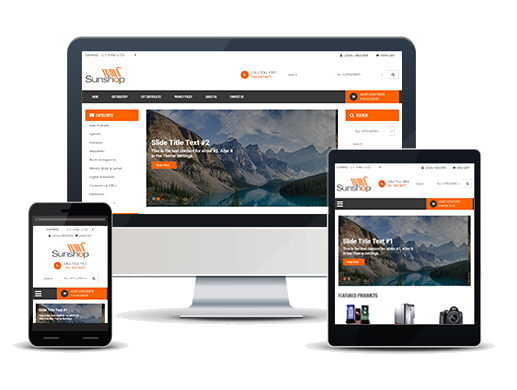 The most comprehensive PHP eCommerce software in its class, SunShop includes everything you need to build your online storefront, market your products, take orders, accept customer payments, manage your inventory, automate shipping & fulfillment, track shipments, and MORE. SunShop's highly intuitive web-based Admin Panel gives you the flexibility you need to configure, customize, and manage your entire online storefront. Just a few simple clicks is all it takes to design and alter the look of your online store through SunShop's "template-based" eCommerce system. Your customers can access your eCommerce site from any device and the layout will display appropriately automatically. SunShop is currently integrated with over 80+ payment gateways and services around the Internet. Support for digital goods and secure delivery after an order is completed. Shipping rate lookups with major carriers & automated fulfillment capabilities.